*Current Customers: New autotext for additional improvements and site parcels is located at the bottom of this webpage. Automatic multiple parcel totals for areas, frontages, etc. Automatic multiple buildings totals for areas, units, rooms, etc. The “5/11” build features significant improvements, some of which require an automated one-time modification to your Word templates (optional). Because we now have up to 10 parcels/buildings, we now have up to 10 assessments, site sizes, building sizes, etc. In some cases, we also have a total for the 10. This means instead of a single field for Acres, or Gross Building Area (GBA), we now have 10. For example, in previous builds, we have a field for “Acres”. That field is now “Parcel1Acres”, or Parcel2Acres, etc. Similarly, “GBA” is now “Building1GBA”, “Building2GBA”, etc. We also have new fields for totals: “ParcelsTotalAcres” and “BuildingsTotalAcres” and many more like this. Easy! Narrative1 will do it for you. 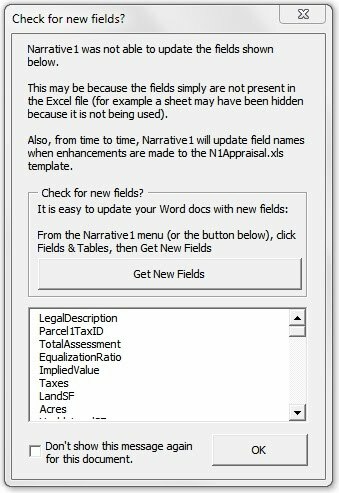 Run a merge with your Word template and the new Narrative1 Appraisal.xls file. Narrative1 will recognize that some merge fields need to modified. For example, the merge field for “GBA” should be modified to “Building1GBA”. After the merge is run the user will prompted to check for New Fields. 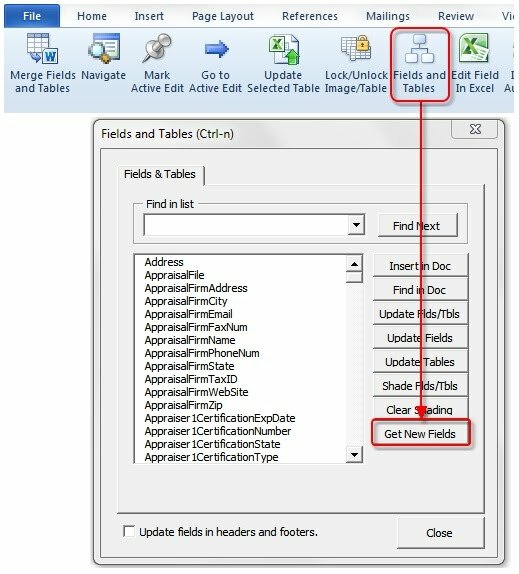 Simply run the Fields and Tables utility and click “Get New Fields”. Narrative1 will scan the Word document and modify the merge fields for you. This only needs to be done once for each template. With more parcels and buildings, there are more names. The tables below shows name conventions.